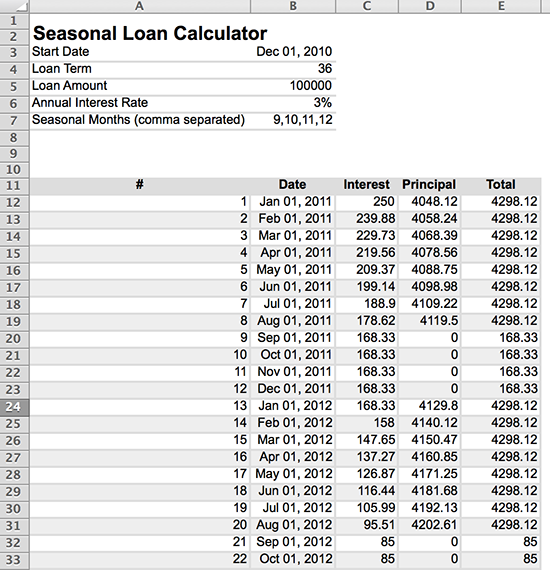 Hi I can compute a Basic Loan Amortization Schedule, But now I'm trying to Calculate a Seasonal Loan Amortization Schedule . So for example A loan starts at January And Will go on for 3 years, with Monthly Payments. Interest is at 3% Annually and is compounded Annually. During the months of September, October, November, December It'll only accumulate Interest But no payments and principal. Principal is 100000. How Do I calculate Payments and interest. In the formula each a(1 + i)^(-k/n) term is a payment. Solving gives the monthly payment ,a, as demonstrated earlier. By omitting payments for September, October, November & December, (since a for these dates is zero), solving finds the payment amount for the remaining 24 months. So to repay the loan in 24 equal payments each payment should be 4338.17. The interest remains 3% annually. Taking another go to match the output of the Hema calculator. Not the answer you're looking for? Browse other questions tagged loans calculation amortization or ask your own question.